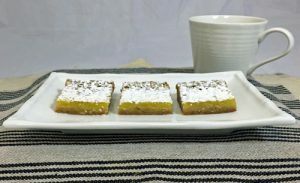 Lemon Bars - J&J Snack Foods Corp.
Heat oven to 350°F. In ungreased 13×9-inch pan, break up cookie dough. With floured fingers, press dough evenly in bottom of pan to form crust. Bake 15 to 20 minutes or until light golden brown. In large bowl, beat eggs with wire whisk or fork until well blended. Beat in granulated sugar, flour and butter until well blended. Stir in lemon peel and lemon juice. Pour mixture over warm crust. Bake 20 to 30 minutes longer or until edges are light golden brown. Cool completely, about 30 minutes. Sprinkle with powdered sugar. With knife dipped in hot water, cut into 6 rows by 6 rows.